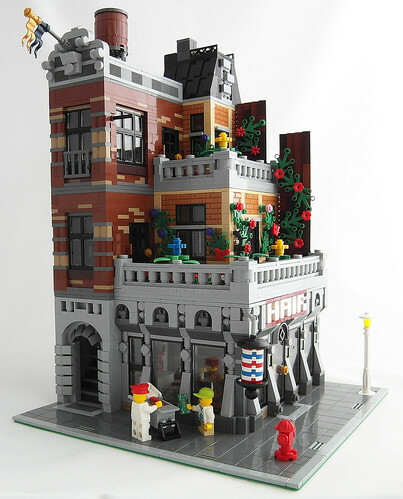 Brick Town Talk: A Breath of Fresh Air - LEGO Town, Architecture, Building Tips, Inspiration Ideas, and more! Setback Street - (BTT) Apartment living can have its perks, but often times any positives get outweighed by the simple fact that you have no outdoor space to call your own. Not so for those dwelling here - both the second and third floors feature ample terraces for everything from growing a garden to getting some rays. Those who can't afford such luxurious living but can afford a hair cut are in luck - a barber shop takes up the majority of the ground floor and get your locks looking lovely in no time. I love the Open air Terrace Idea, it would give a fresh look to some of the Squared off corners in a modular town.